One week after the byelection was announced, the New Democrats are now in full campaign mode. Federal NDP leader Jagmeet Singh is in town today to campaign with candidate Bob Chamberlin, who won the party’s nomination contest yesterday. Singh said Chamberlin brings a wealth of leadership and has been an “incredible voice” not only on indigenous issues but also on affordability and quality of life for all Canadians. “His leadership role that he’s played with indigenous communities shows that he’s got the ability to be a strong advocate, someone who’s willing to stand up for the community and what the community needs,” Singh said. The NDP leader has just been through a byelection, successfully winning a House of Commons seat representing Burnaby South, and suggested a byelection campaign is a little different from a general election. “There’s a heightened focus on the riding. That’s one element of a byelection, that people really can talk about local issues,” he said. He said it’s important for his party to hold the Nanaimo-Ladysmith riding. “We know there’s a strong base here, people that care deeply about the things that we care about and we want to let them know that we’ve got their back and we’re going to fight for them and they can count on us to make sure that they’ve got a strong voice in Ottawa,” Singh said. The NDP leader said the byelection presents choices for voters. He said the Conservatives are telling voters they should “go it alone” on housing and some other social issues and Liberals are telling voters that the way things are in B.C. are good enough. “And then New Democrats, who are saying, we’re going to push and fight hard for you to get the results that you need,” Singh said. He previewed that he will be making a platform announcement tomorrow regarding pharmacare. Singh suggested the Liberals’ announcement of a national drug agency isn’t a firm commitment and won’t result in coverage for everybody. “We’re going to lay out our vision for a universal, publicly funded, comprehensive medication for all program,” Singh said, adding that it will save families $500 a year on average. “It’s going to mean that you don’t actually have to use your credit card to get medication. You can use your health card,” he said. Chamberlin said costs of prescription drugs are an issue he’s heard about very clearly. The Nanaimo-Ladysmith federal byelection is May 6. 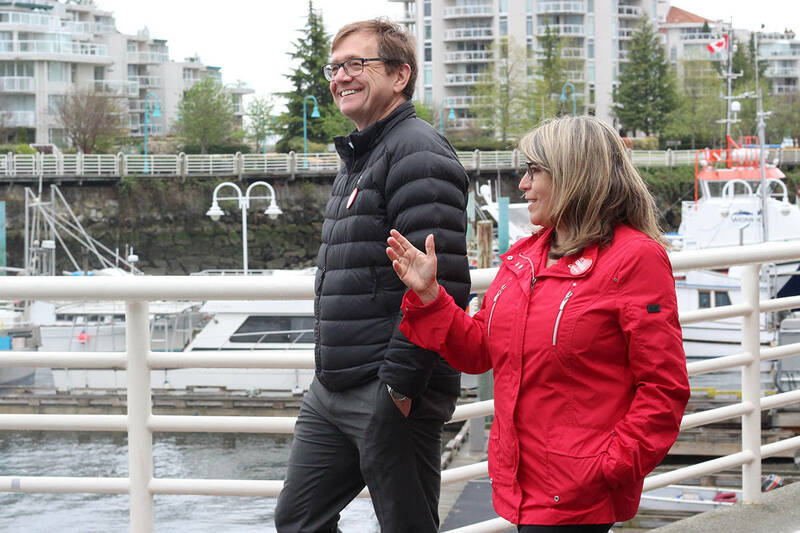 Other candidates include Michelle Corfield, Liberals; John Hirst, Conservatives; Paul Manly, Greens, and Jennifer Clarke, People’s Party of Canada.